Above all else, this goes without saying, but I’m gonna say it anyways. Before planning your outfits remember the essentials: sunblock, goggles, a face mask for dustier days, a tasteful umbrella, and shoes that will protect your feet from getting dried out by the desert. 1) A huge trend at Burning Man is fur. It gets cold at night, so although wearing next to nothing during the day is nice to try to warm up at night. Fur vests and coats are the easiest routes to go. If you don’t already own fur or perhaps faux fur, try looking at a local thrift store. Pair it up with head gear of the same color, fur boots, or whatever crazy fur accessories you can get your hands on. 2) Build your costume around a hat you really like. Not a baseball cap. No, no, no, no. Think bigger, think costume worthy. Once again use past Halloween costumes as inspiration or the local thrift store. Perhaps it’s an old cowboy hat or a feathered headdress. Once you find it, pair it with loose baggy pants and consider going shirtless for the day. Dress it up with whatever chains you feel add to the look or bandanas. 3) Play up a basic cape. Forget about your inner superhero and go deeper. Find the inner traveling marauder trekking through the sun worn desert. Use a pair of comfortable pants whether baggy or skin tight, and add a bulky belt to add to it. 4) A common timeless trend that is fun to play up for the day is a steampunk look. It completely lends itself to wearing goggles and keeping your eyes protected while having a more dressed up vibe. Use an old school hat as a potential accessory and high button up boots. This choice of dress also allows you to layer up with vests or jackets as long as you keep it on the leather or dark fabric side of the spectrum. 5) Dress up a basic outfit with el wire. This is best used at night so that people can spot you out of the crowd and not run you over with their bikes. You can use it to fringe something or create your own design. Some people get super creative and some keep it basic. 6) For a day when you don’t want to wear much, you can resort to a lightweight heat friendly tutu. 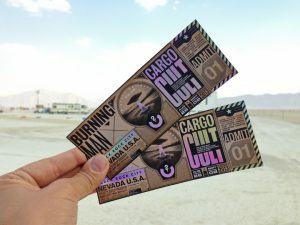 It sounds a little crazy but when you go to Burning Man you’ll see it’s a hit with everybody. Use it for a day when you don’t really feel up to wearing an elaborate costume and would rather peruse the art being created. Different ways you can add to it may be by wearing a mask or a bandana to keep you cool. 7) Body paint is a direct way to translate your body into the art scene of the event. Either you can find someone there to help you with it or you can do it yourself. Have an image or idea in mind and be prepared to bring your own skin friendly paints. 8) Use the traditional kilt for the basis of your outfit. Go bear chested or cover up with a tank or scarf. Kilts can come in a variety of fabrics such as cotton or leather. Pick one that will help you stay cool while you spend the week in the desert. 9) Wear as many bright colors as possible all at once. A lot of guys do this probably without thinking too deeply about it and then realize that others had the same idea and brought it to life in a completely different way. That the great thing about working with basic costume ideas like these, it’s up to interpretation. 10) Don’t underestimate your facial hair. You probably won’t be shaving every morning out there so why not play it up? Start growing our your beard or mustache a few days before you go and keep it evolving throughout the event. With this as the main part of your look, you can play around with whatever clothes you want. If you still haven’t, try on a pair of wings or wear a nice vest and headband ensemble. EverythingFest.com is a participant in the Amazon Services LLC Associates Program, an affiliate advertising program designed to provide a means for sites to earn advertising fees by advertising and linking to amazon.com.